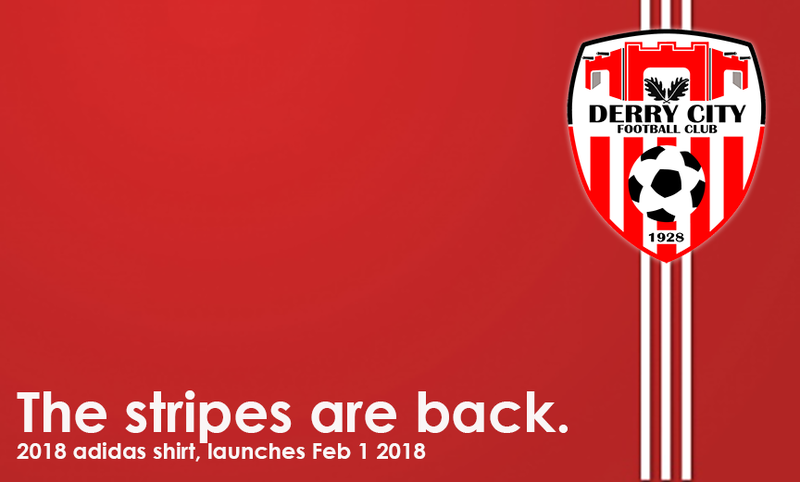 Derry City will launch the new 2018 adidas home kit on 1st February 2018. The kit will be unveiled at an exclusive season ticket holder only event to be held in the City Hotel at 7.45pm on 1 Feb. Given the huge demand experienced for the adidas range since the launch in December 2017, the club have organised this event in order to ensure that season ticket holders have the opportunity to purchase the kit on the night. As another reward for season ticket holders, all those holding full paid season tickets will be entered into a draw on the night to win a free shirt. Orlaith Meenan, Club Commercial Manager “We are delighted to offer our season ticket holders the chance to purchase the shirts first, given their loyal support for the club on our return to Brandywell. There is still time to get your season ticket online or in person, so make sure you don’t miss out”. As part of the launch supporters will have the opportunity to find out the latest about pre-season preparations and also how some of the new signings are settling in with a brief Q&A with manager Kenny Shiels. As well as the 2018 home shirt, a full range of adidas Leisurewear will be on offer for sale on the night. Please note: Purchases will be limited to one shirt per season ticket holder, will stocks last.